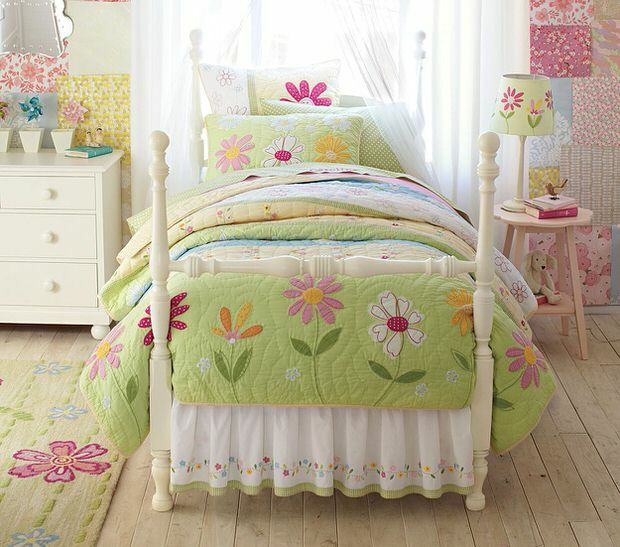 My youngest daughter had a garden bedroom, and it was my favorite room in the house. More than once after a long day I’d be rocking in a chair in her room surrounded by sunny yellow walls, floating clouds, blooming flowers and happy butterflies. She was only 2, but I hope she remembers it as much as I do! 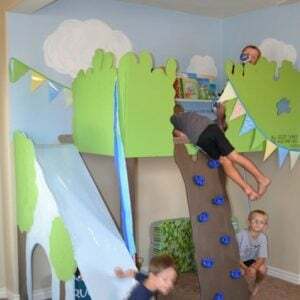 You can DIY a garden theme room for your girl too! Getting started is easy. 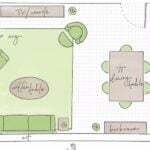 Just picture the garden you dream about in your mind, simplify it, and make it happen! 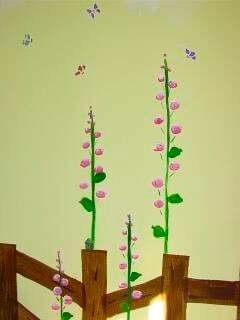 The first thing I always do is bring out the paints, and painting a garden on the walls is much easier than it sounds. Paint the wall a background color that matches your mood – blue, yellow, pink, light green, and lavender all evoke a garden light. First, consider stencils. You can find small ones with blossoms and leaves at craft stores for less than a buck, you can cluster the flowers for larger designs, and tape off any part of the stencil you don’t like. Then simply paint stems freehand with a brush and slightly thinned paint. After it dries, you can add more depth to leaves and stems by highlighting a little with some off white paint, just touch a little line on the edges where the light would realistically hit, here and there. I like to keep the flowers together in clusters, for example, a group of sunflowers, then a group of roses, then some hollyhocks. Of course, you can repeat the groups, but it looks more cohesive than sprinkling the different flowers through randomly. 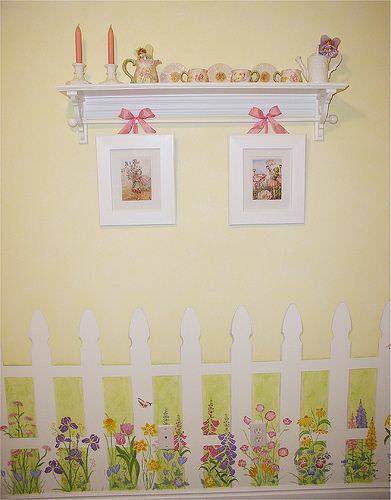 I love how this garden room from HGTV’s Rate My Space used both stencils and freehand to create this cute picket fence garden! For a 3D effect, consider cutting blossoms from felt, layer several together, then push a colored tack (or fancy scrap-booking pin) through the center to hold it to the wall, and also be the center of the flower! You can also use the felt flower idea to sew flowers to a comforter, curtains, or even dress up their furniture with a glue gun! 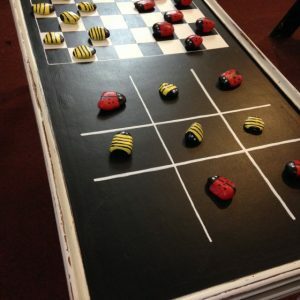 When sewing, use leftover buttons as the centers. 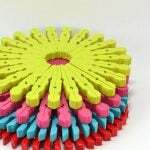 Felt is cheap, and you can use scraps! 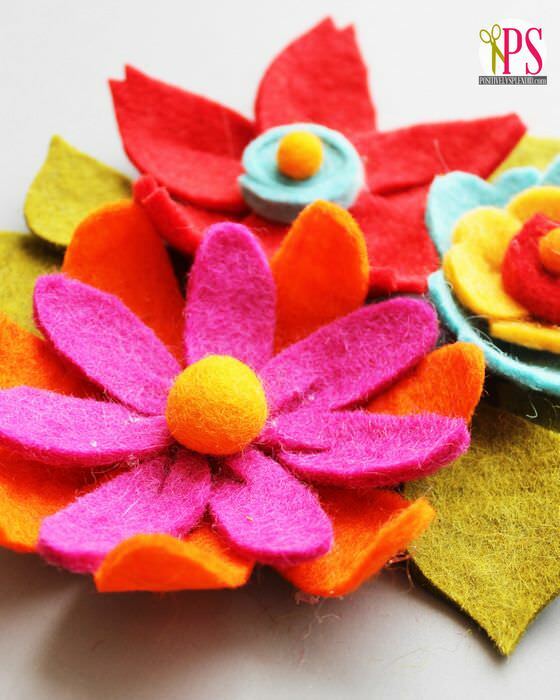 Follow this tutorial for DIY felt flowers from Positively Spendid. 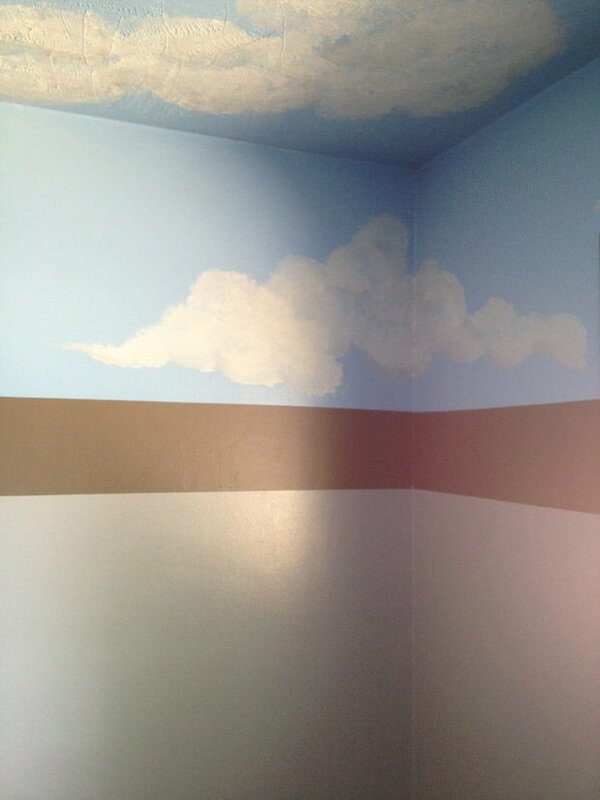 Paint the ceiling blue and rag some clouds on with an old rag and some craft paint. Check out how to paint clouds for non-artists by ‘DIY in Real Life’! Add some coolness factor with DIY flower lights by ‘Oh Happy Day’… one more use for cupcake liners! Bees Knees Bungalow brings us the Bachman Ideas House, with these great garden gate headboards! 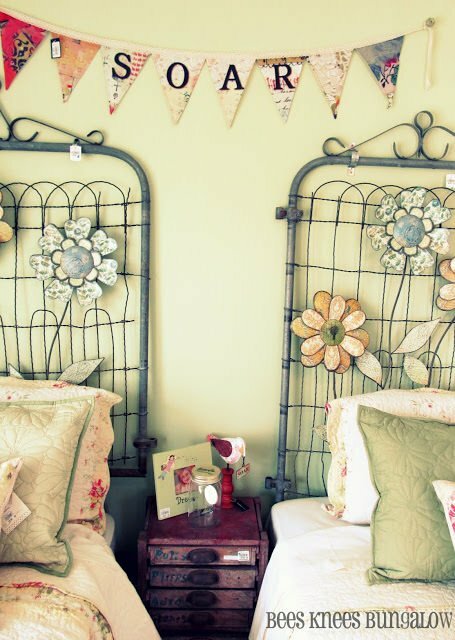 Click through to all the photos, there are two twin beds in this room with matching headboards, and more cute garden theme ideas… CUTE! 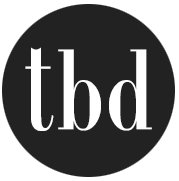 Finally, add some garden accessories- terra cotta pots for dresser top storage, a piece of lattice as a display board, make some simple wood planters for bookshelves, let your imagination travel to the outdoors. 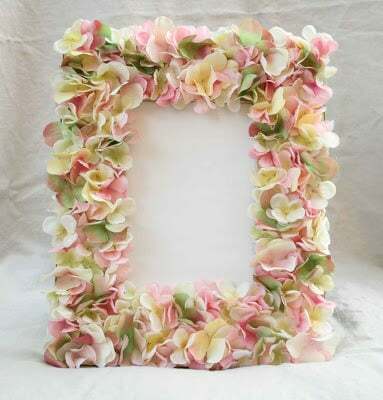 LOVE this flower petal frame from ‘The Creative Place’! 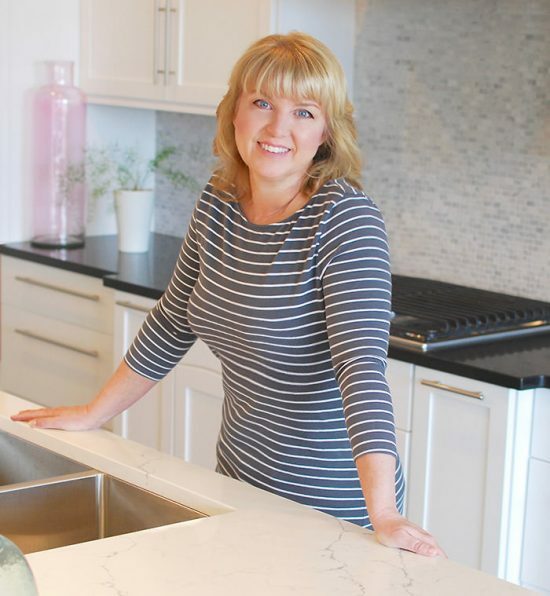 Check out her tutorial to do this easy project. Some really lovely ideas on here Kathy. Thinking of decorating my twin daughters bedroom soon and I really love the matching headboards, think my girls would love it!